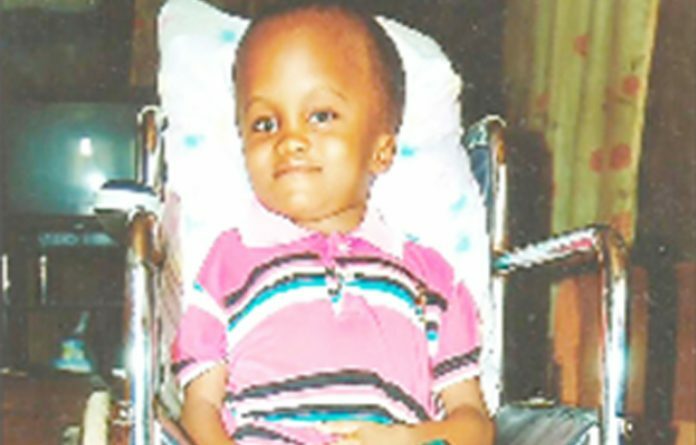 The birth of Kehinde Yusuf, an eight-year-old boy with hydrocephalus ailment to the family of Mr. and Mrs. Isiaka Yusuf on September 19, 2009 was celebrated with pomp and pageantry. He was born a normal child like his twin brother, but a sickness that took Kehinde Yusuf to the hospital where he was infused with drips via his head, saw him coming down with a swollen head. Visibly distressed, his father has been moving from one hospital to the other seeking for his son’s full recovery sent a SOS message through INDEPENDENT to Nigerians for financial assistance. He narrates his ordeal: “I am Isiaka Yusuf, 52, a recharge card seller while my wife is an auxiliary nurse. My eight-year-old child, Kehinde Abdul-Raheem Yusuf has been receiving treatment at the University College Hospital (UCH) Ibadan since June 2011 for hydrocephalus ailment. “He and his twin brother, Taiwo, were born normal but six months after being born on September 19, 2009 at Iseyin General Hospital, Iseyin, Oyo State. Kehinde had repeated high temperature prompting me and my wife to take him to Ado-Awaye General Hospital, Iseyin Local Government Area of Oyo State where the Chief Medical Director of the Hospital who also doubled as the owner of Holy Land Hospital, Peller Road, Iseyin, in Iseyin Local Council passed a drip via his head. Two weeks later my child’s head started growing more than his entire body and he could not sit neither could he walk nor control his head since then. “He had undergone two surgeries, one at the University College Hospital and the other at the University of Ilorin Teaching Hospital, and currently undergoing physiotherapy at the University College Hospital (UCH). “Meanwhile, his doctor says he has to undergo a minor surgery on his legs and some other treatment estimated to cost N400,000 or more, even as we are yet to see any change in my child after spending fortunes on him since March 2010 as a result of which I have sold virtually all my properties to see him through. Before going to the University College Hospital (UCH) in 2011, I have taken him to about 10 different private and trado-medical hospitals. “I am now tired and seeking the assistance of members of the public to help raise this fund to treat him or assist in taking him to any hospital in Western countries for better and less-stressful treatment. Isiaka Yusuf can be reached at No. 231 Ire Akari Quarters, Tose, Moniya, Ibadan, Oyo State, Nigeria or call 08022300344, 08059001989. His bank details are Guaranty Trust Bank (GTB) Account Number 0151945965, Account Name Kehinde Abdur-Raheem Yusuf or Skye Bank Plc Account No. : 1031284723 Account Name is Kehinde Abdur-Raheem Yusuf. His UCH Ibadan Hospital’s number is 1209980 for verification.